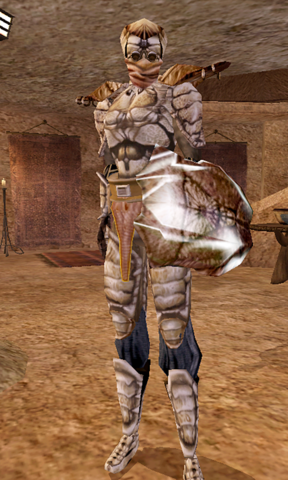 The Buoyant Armigers are a band of military enforcers that are exclusively male and swear complete loyalty to Vivec who appear in Elder Scrolls: Morrowind. In Elder Scrolls lore, the first Buoyant Armigers helped Vivec defeat the Horde Mountain monster. As a part of their training with Vivec, the Buoyant Armigers are also thought to have learned “the secrets of lust”. In which case, fans speculate that they would have copulated with both Vivec’s male and female forms. This entry was posted in 2000s, Bisexual, Bisexual (implicit), Characters, Gay, Gay (implicit), Queer Men on September 5, 2016 by Adrienne Shaw.